I’m grateful for being recognised for merely contributing to the game. I’m grateful that rugby help shape my life. 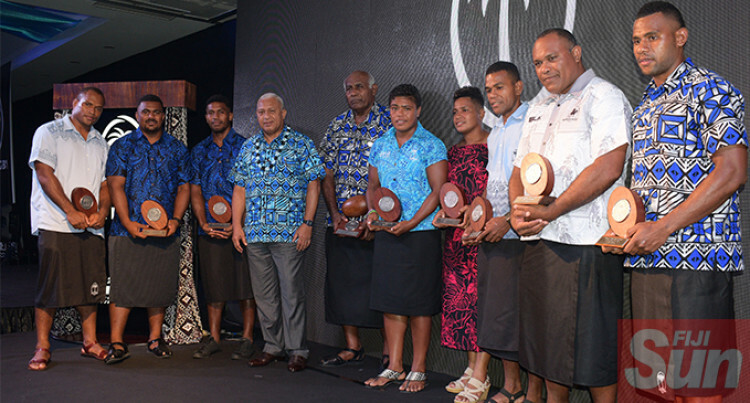 The winners from the FRU Awards night with Prime Minister and President of FRU Voreqe Bainimarama at GPH Suva on February 9,2019.Photo:Simione Haravanua. Ratu Ilaitia Tuisese is among the very few rugby honourables re­maining. If you talk about sevens rugby, he was among the pioneer of the abbre­viated code being the captain, coach and manager of the Fijian team that played at the inaugural Hong Kong Sevens in 1976. One year later, he became the first Fi­jian to lift the Hong Kong 7s title at So Kon Po. In 15s, he capped off a brilliant ca­reer which started against Wales in June 25, 1969 and with a historic 25-21 win over the British & Irish Lions on August 16, 1977 in Suva. After his playing career, he took up coaching and administrative roles in the sport for Naitasiri and Fiji Rugby Union and forever a loyal for the game. He is among those strong men who have toiled over the years, surviving the school of hard knocks playing the sometimes brutal but beautiful game with pride and passion. And today he stands tall knowing he has done the job after playing the game which is now our national sport. On Friday, the Soloira, Naitasiri na­tive was inducted into the FRU Hall of Fame. And he dedicated the occasion to the former reps who help shape and grow the game. “I’m among the few remaining from our rugby generation and I dedicate the occasion to former reps and ad­ministrators who contributed im­mensely in shaping the game for us,”Tuisese said. He was not expecting to be given such an honour by FRU. “I was at the village attending a church meeting when I received the call to attend the rugby awards,” he said. ‘But when I was invited to sit on the top table with FRU president and Prime Minister Voreqe Bainimarama, I knew something’s brewing. “I was not expecting it but a pleasant surprise. “I’m grateful for being recognised for merely contributing to the game. I’m grateful that rugby help shape my life. ‘Rugby has taught me a lot, adminis­trative and leadership-wise. Current players should always strive to be the best in the business and they will be person in life.